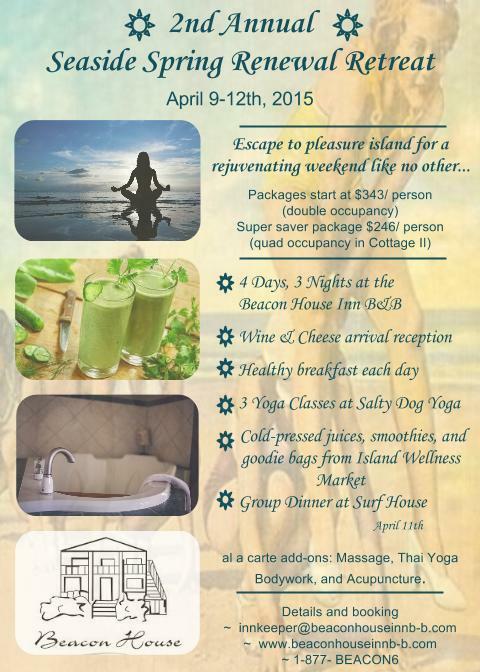 You are invited to join us at the Beacon House Inn Bed & Breakfast for our 2nd annual Seaside Spring Renewal Retreat April 9-12, 2015! This event falls at the perfect time for you to shake off the winter time blues and literally spring into summer. We have planned four days for you to rejuvenate your mind with yoga, revive your spirit with a relaxing time on the beach, and renew your commitment to a healthier lifestyle with fresh, delicious meals. This will be a wonderful time of camaraderie with like minded souls; perfect for a girl’s getaway to the beach or partners young and old seeking to unwind, rekindle, and connect with one other. We have prepared an earlier check-in of 3pm for our guests to relax before our welcome wine and cheese reception that evening. Each morning will feature a hand crafted healthy breakfast accompanied by a raw, cold-pressed juice from our partner Island Wellness Market. Three yoga classes will be provided by Salty Dog Yoga & Surf, at their oceanfront studio, with several options available suited to all practice levels. There are also plenty of additional classes/services you can add on as you wish, such as Thai Yoga body work, acupuncture, or massage. We will all enjoy a luscious three course group dinner at the Surf House on Saturday evening. Because our retreat is about relaxation, there will be plenty of free time for you to spend at the beach sightseeing or shopping. Finally, we will send you off with some great swag from our partners so that you can remember this fabulous time fondly! To close the weekend, we have arranged a later check-out of 1 pm on Sunday so you can take full advantage of your time at the beach. We are looking forward to a wonderfully enjoyable time this April at our Seaside Spring Renewal Retreat and we sincerely hope you will be able to join us! Save by booking early! Take advantage of our Early Bird Registration of 10% off room rates when you book by March 15th, 2015! Do you have a group of three or four travelling together? Book one of our vacation cottages for a real Super Saver rate! To book your reservation simply visit our website at Beacon House Inn Bed & Breakfast or call us at (877)-BEACON6. If you have questions or would like more details you can also email us at Innkeeper@beaconhouseinnb-b.com. This entry was posted in Bed and Breakfast, Carolina Beach, Dining, Inn Events, Packages, Spring Events, The Beacon House, Wilmington and tagged bed&breakfast, carolina beach, foodies, health, north carolina, wellness, yoga by admin. Bookmark the permalink.